Kernaghan, Lois and Peter Murchland. "Dalhousie University". The Canadian Encyclopedia, 17 July 2015, Historica Canada. https://www.thecanadianencyclopedia.ca/en/article/dalhousie-university. Accessed 18 April 2019. Its auspicious beginnings were soon marred by governmental indifference and sectarian rivalry. Both the colonial establishment and the college's board of governors were unenthusiastic, favouring instead the precedence of King's College. Dalhousie was founded in 1818 based on the standards of Edinburgh University (photo by Sherman Hines/Masterfile). 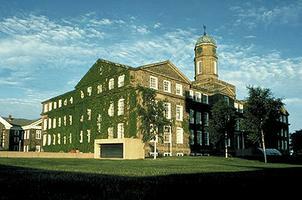 Dalhousie University, Halifax, was founded in 1818 by Lieutenant-Governor George Ramsay, 9th earl of Dalhousie. Dalhousie envisaged a liberal, nondenominational college based on the educational standards of Edinburgh University and offering a progressive alternative to the Anglican University of King`s College at Windsor, Nova Scotia. The institution's initial funding came from customs duties collected at Castine, Maine, during the British occupation in 1814-15. Dalhousie languished until 1838, when Thomas McCulloch became the first president. University status was granted in 1841 but, after McCulloch's death in 1843, the institution again declined and in 1848 was reorganized as a high school. In 1863 Dalhousie was reconstituted as a university, primarily through co-operative Presbyterian efforts to improve higher education. The Presbyterians' willingness to renounce denominational control opened the way for expansion, and progress since then has been continuous. An early emphasis on mathematics and the classics shifted to modern scientific studies, introduced during the latter 19th century. A medical faculty began in 1868; women were admitted in 1881; and the law school - the first to teach common law in the British Empire - was founded in 1883. Since 1879 the university has been financially assisted by such benefactors as George Munro, Sir William Young and Dorothy Killam, enabling continual expansion of both the curriculum and the physical plant. In 1887 Dalhousie moved from its original downtown location to Forrest Hall, now part of a 24 ha campus. The 1997 amalgamation of Dalhousie University with the Technical University of Nova Scotia (TUNS) - now known as DalTech, has resulted in an increased emphasis on advanced technical education and research. 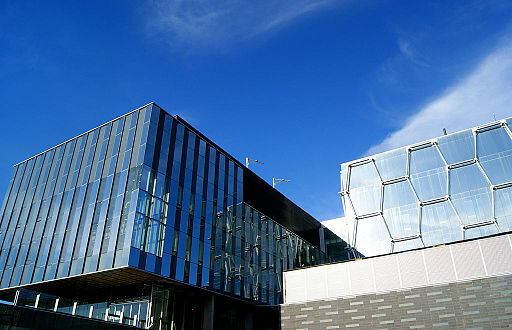 DalTech has become a college within Dalhousie, adding three new faculties to the combined institution - Architecture, Computer Science and Engineering. A direct outcome of collaboration has been the creation of a new Institute of Biomedical Engineering. Dalhousie is a comprehensive teaching university, offering 3600 courses to more than 13 000 full-time students. Dalhousie offers doctoral level study in 41 programs and master's degrees in 71 programs. Professional programs are available in Architecture, Dentistry, Engineering, Law and Medicine. At the undergraduate level, 60 degree and advanced diploma programs are available in diverse specialties. Dalhousie provides continuing education for 15 000 additional part-time students. Dalhousie is a national leader in the provision of student support. Students consistently earn awards from external agencies, including 72 Rhodes Scholars who have been selected from Dalhousie's student body. The university is the research powerhouse for the region, attracting more than $41 million in externally sponsored funding to the region each year. There are 24 special centres and institutes sponsored by Dalhousie: Atlantic Health Promotion Research Centre; Atlantic Industrial Research Institute; Atlantic Institute of Criminology; Atlantic Region Magnetic Resonance Centre; Atlantic Research Centre; Canadian Institute of Fisheries Technology; Cardiac Prevention and Rehabilitation Research Centre; Centre for African Studies; Centre of Excellence in Women's Health; Centre for Foreign Policy Studies; Centre for International Business Studies; Centre for Marine Geology; Centre for Marine Vessel Development and Research; Centre for Water Resource Studies; Dalhousie Health Law Institute; Dalhousie-Kuwait Centre of Excellence in Rehabilitation; Dalhousie Medical Research Foundation; Lester Pearson International Institute; Minerals Engineering Centre, Neuroscience Institute; Nova Scotia CAD/CAM Centre; Oceans Institute of Canada; Trace Analysis Research Center and the Vehicle Safety Research Team. Dalhousie's international development projects and exchange programs circle the globe. Current international development projects are valued at $80 million. International students come from more than 60 countries, enhancing the cultural and intellectual fabric of the university and the city of Halifax. Dalhousie's history provides a solid foundation for the development of exciting new learning opportunities as it heads into the new millennium. Dalhousie UniversityThe official website for Dalhousie University. 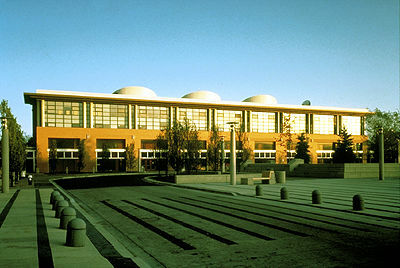 Provides extensive information about academic programs and university events.